Casa Sonrisa is a 100 sqm = 1.100 sqft. one bed room bungalow. There is the option of two separate beds or one King Size with firm orthopaedic mattresses for a great snoring. The dining and living area is furnished with very comfortable equipales and the tiled patio invites to 'dining outside'. go beach combing and find some "treasures". warm but very dry days and cool nights. Even in August is the avreage daytime so close to the beach in the mid to upper 80th, always a little breeze from the north and at night is the Coromuel Wind phenomena which cools down to the mid to upper 60th F.
with the seals at Los Islotes. you all about the gorgeous Baja, where to go and what to see. We answer EVERY mail, vacancy or not. 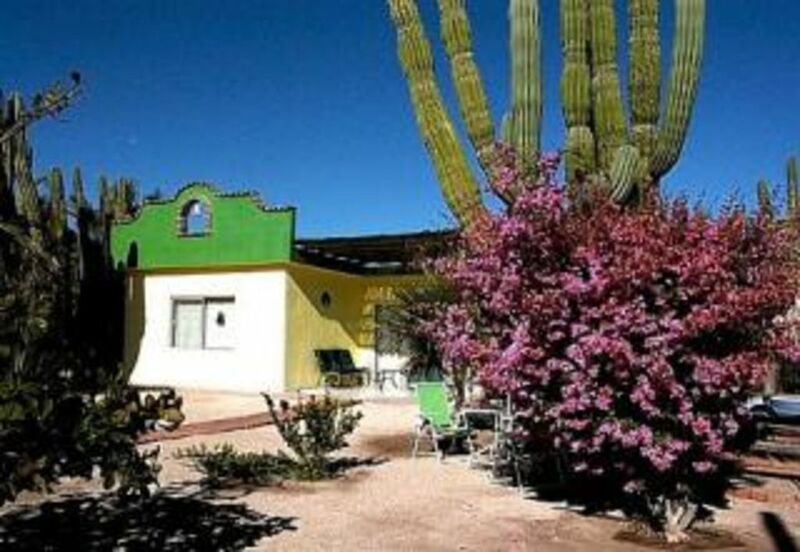 If you don't get any response in 24 hrs, check your spam folder for the subject line "Hacienda del Sol" or give us a call. Sorry, we are not allowed to note our Web site or e-mail here. You will find the phone number on top of this page and don't worry, we speak your language!! Contact us for more and detailed information by clicking on the "Click Here To Send Email" button on top of this site and we will send you our web site URL. big city has to offer. Since we are only 11 Miles from downtown, it is nice quiet here and of course fresh air. You can be at the Malecon (Sea Promenade) in a few minutes on the 4 lane. See the artist performing in the evening, sit at an outside restaurant and let the world go by when you enjoy a fantastic meal. It really is beautiful here and we love to show it to you and when you get tired of the big city, in a few minutes you are back at your 'home'.